Namib-Naukluft National Park – Travel Guide, Map & More! 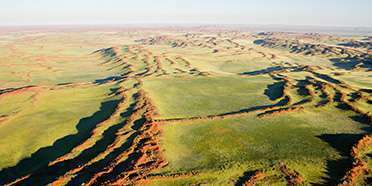 The Namib-Naukluft is one of Africa’s largest parks. It is home to the Sossusvlei area – an ocean of enormous red dunes and one of Namibia's main tourist attractions. The character of the dunes is constantly being reshaped by shifting sands and the changing light of the day. The desert habitat doesn’t support many large animals, but if you take time to absorb the spectacular scenery and smaller creatures, any visit here will be more than worthwhile. The park is not primarily a wildlife destination, but quite a few species are easily encountered. Seeing a herd of oryx walking between the red dunes in the Sossusvlei area is an unforgettable sight. To see more wildlife, you need to go to other areas of the park which are less visited. 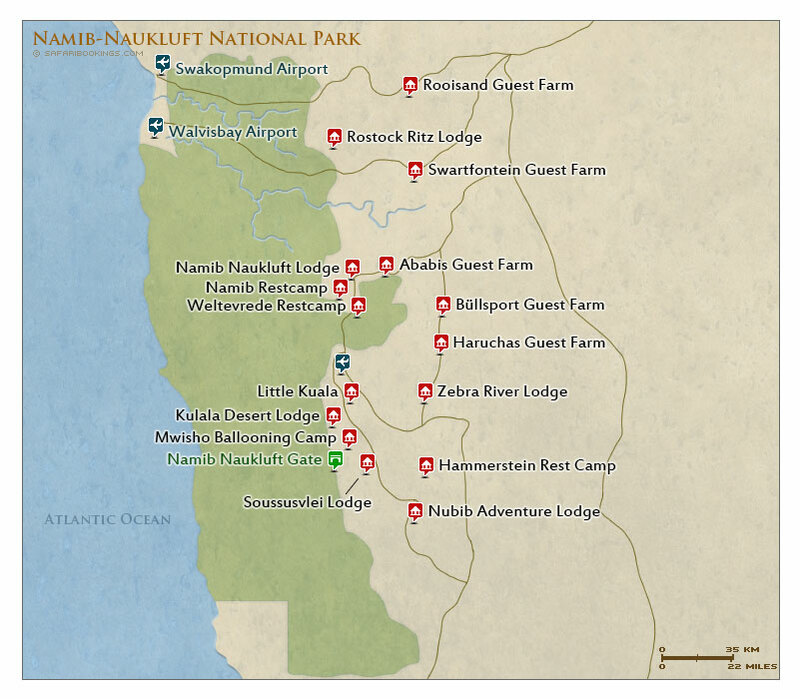 The Naukluft massive is primarily a hiking destination and Hartmann's mountain zebra are easily spotted here. 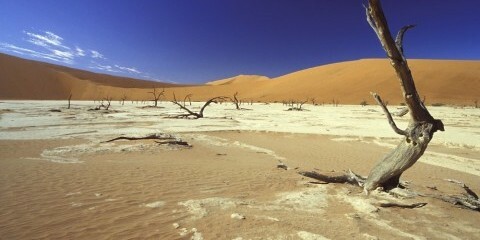 Namib-Naukluft has amazing desert scenery. A famous photo opportunity in the Sossuvlei is Dune 45, known as the most photographed dune in the world. It is 80m/262ft high and can easily be climbed. 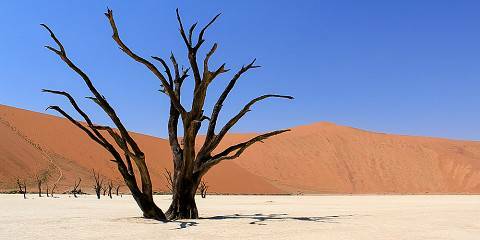 Another one is nearby Deadvlei; a white pan dotted with dead acacia trees against a backdrop of massive red dunes. A less visited, but also very scenic landmark, is the much lusher Naukluft Massif; a mountain area with deep gorges and crystal clear springs. You won’t see much rain in this enormous park, even though summer (November to April) is regarded as the region’s Wet season. The only significant precipitation – if you can call it that – comes in the first few months of the year; those trekking in the mountains should beware of flash floods. Sub-zero temperatures can occur in winter (May to October), but these are restricted to the park’s higher altitudes. If you want to go searching for wildlife in the Naukluft Mountains, and particularly if you’re tying this in with an Etosha jaunt, visit in the Dry season (May to October). Just be prepared for crazy crowds at Sossusvlei, and early morning chill. The wetter months can get ridiculously hot, though the blooming desert flowers can make the heat worthwhile. 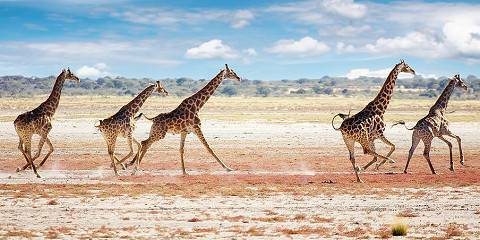 Want to Visit Namib-Naukluft NP?